The P-47 first flew on May 6. 1941, emerging as the largest and heaviest single-engine fighter ever made. Straight and level, it showed blistering speed and exemplary high-altitude performance, and it first went into combat in the spring of 1943 with the 4th Fighter Group in Europe. This was just the beginning of an extraordinary combat career. 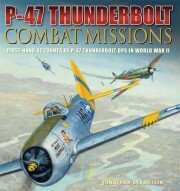 The P-47 flew and fought across Europe, the Mediterranean, the China-Burma-India (CBI) theatre, and the Pacific. What made it so useful to the allies was its sheer punch – the P-47 could take on both the air-to-air combat role and the fighter-bomber role with equal confidence. P-47 Thunderbolt Combat Missions explores every aspect of this aircraft, both operational and technical. The numerous first-hand accounts not only give an immersive insight into the combat experience of P-47 pilots, but also explore their day-to-day lives. Alongside their stories are numerous unpublished archive and memorabilia photos, the whole forming a detailed record of this stellar airplane and its crew.